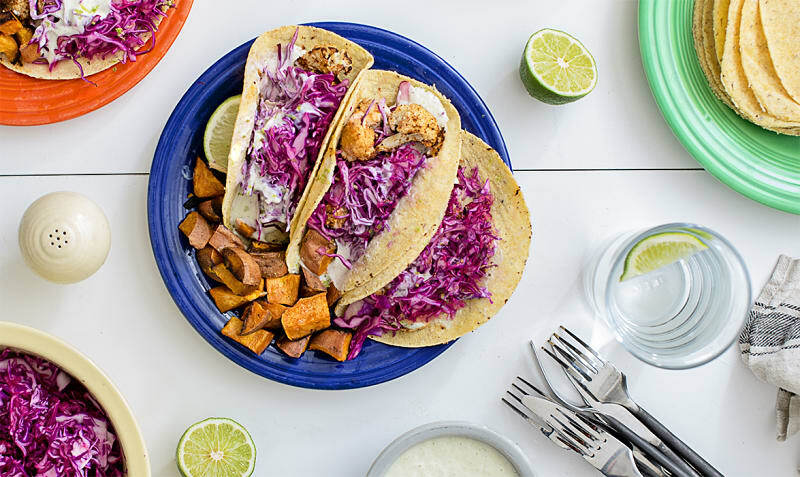 Seasoned, roasted cauliflower is the star of this dish, but the lime crema and red cabbage slaw bring bright flavour and texture to the tacos as well. 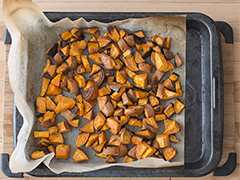 Served with roasted yams for a filling weeknight dinner. Best prepared within two days of delivery. Preheat the oven to 400°F and line 2 baking sheets with parchment. Wash the yams and chop into ½ inch chunks. Place the chunks in a single layer on one of the baking sheets and drizzle with 1 tbsp oil and salt to taste. Place in the oven and roast for 25-30 minutes, or until tender. 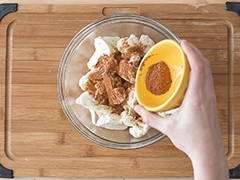 In a large bowl, toss cauliflower florets with spice mix and 1 tbsp of oil. Spread in a single layer on the other baking tray and roast for about 20 minutes, stirring halfway through. Shred the cabbage and place in a bowl. Add the juice of one lime and a pinch of salt. Toss well to combine and set aside. While the cauliflower and yams are roasting, make the crema. Juice and zest a lime. 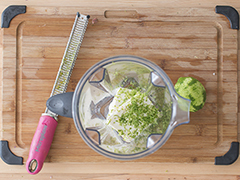 In a blender, mix the tofu, the lime juice and zest, a pinch of salt and a tbsp of oil until smooth. Heat the tortillas according to the instructions on the package. Place 3 tortillas on each plate and evenly divide the cauliflower and cabbage amongst them. 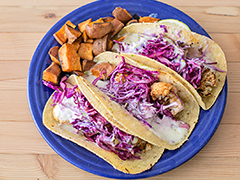 Top with crema and serve with roasted yams and lime wedges.